Dr. Gojgini has a longstanding commitment to providing optimal dental care utilizing the most current dental techniques and products. His goal is to educate and engage every patient to make the best decisions concerning their oral health, so each patient can enjoy their most vibrant smile! 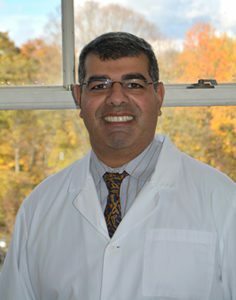 Dr. Gojgini received his Bachelor’s Degree in Chemistry from Tufts University, and subsequently received his Doctor of Dental Medicine Degree from Tufts Dental School in 2000. Dr. Gojgini is highly skilled in all phases of restorative and cosmetic dentistry. Dr. Gojgini has increased his knowledge about sleep disorders, snoring, and obstructive sleep apnea. Through educational support from the AADSM, Dr. Gojgini has been able to help patients interested in pursuing alternatives to the CPAP. In addition, Dr. Gojgini has completed the world renowned surgical implant symposium offered by the Misch International Implant Institute and Dr. Carl Misch, one of the premier implantologists and pioneers in the field. This year-long program enables Dr. Gojgini to use cone beam radiographs and cutting edge dental implant placement software (Simplant) to properly plan surgical and restorative treatments. Through the American Academy of Facial Esthetics (AAFE), Dr. Gojgini recently completed a comprehensive program for the administration of nonsurgical injections and dermal fillers, not only for cosmetic purposes like reducing the appearance of crow's feet and forehead lines, but also for therapeutic purposes, to minimize the side effects associated with chronic headaches, migraines and TMJ dysfunction. Dr. Gojgini and his wife, Andrea, live in Belchertown with their son, Andrew. When not in the office, Dr. Gojgini enjoys playing golf and basketball – and attempting to do house projects! If you are looking for a dentist who is skilled in the latest treatment technology, who puts your comfort and needs first, call River Valley Dental today!